Vancouver's new City Council seems to have set itself up for a defining moment that may make many councillors squirm in discomfort. How awkward it could be, so early on, to face a vote on substance that would be hard to present as the nicey-nicey unanimity of "working together." The hot potato item? 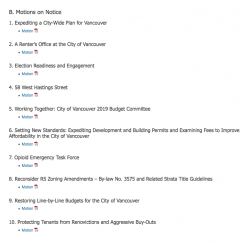 Number 8 out of 10, put forward by Hardwick: Reconsider RS Zoning Amendments – By-law No. 3575 and Related Strata Title Guidelines. Here is how eight of the eleven jockey for position at the kickoff council meeting by having their names attached to ten Motions on Notice: Boyle (1), Carr (1), De Genova (2), Fry (2), Hardwick (3), Kirby-Yung (1), Stewart (1), Swanson (2). Thus far just observing are Bligh, Dominato, and Wiebe. On 19 September 2018, the ultra-last lame-duck hobble of now decimated Vision Vancouver was to approve by a vote of 7 to 4 a measure to mass rezone approximately 99% of 68.000 RS zoned lots in Vancouver to accommodate duplex. Seven Vision Vancouver in support, three NPA and one Green opposed. The new council features 5 NPA and 3 Green, a strong majority that can do pretty well anything it chooses to. On the other hand, the easy and crude and possibly dominant left-right split is seen as 6 (3 Green, 1 COPE, 1 One City, 1 Independent) "progressives" aligned against 5 NPA. Recent reporting on this situation shows Green froth and dither over being pig-in-the-middle. 24 October: Last month Carr said her party wouldn’t go so far as to reverse the duplex legalization after its passage. 8 November: Carr: "I think Colleen sort of jumped the gun on me." Meanwhile, Carr seeks feedback from city legal and planning departments. 9 November: Fry says Green will meet on weekend "to discuss what to do about the duplex motion"
• Whatever their labels, Boyle and Kennedy "ran together with" Vision Vancouver. Would they now stand 2 to 9 against rescinding duplex in RS? • Will Green caucus tight? Or might the three split in their voting? • Swanson (COPE) disfavors duplex in RS for lack of tenant protection and failure to impinge on landowner profit. Together with NPA, Swanson could carry the vote and make Green irrelevant. 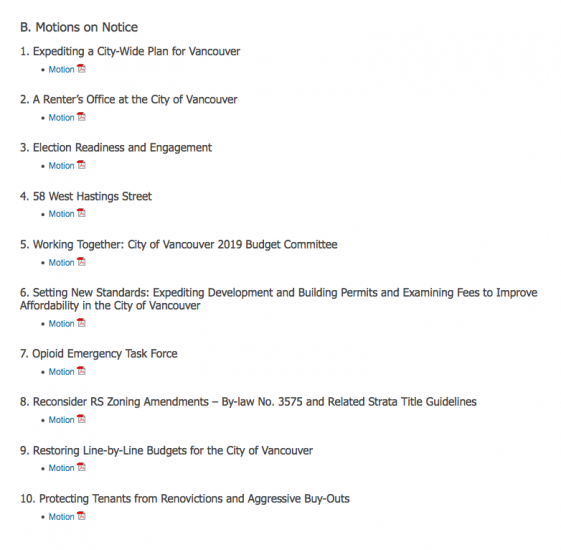 It seems likely that the symbolism of rescinding duplex in RS as a repudiation of ten years of Vision Vancouver will prove irresistable to a majority, if not to a unanimous council.